Stop Puppy Biting With These 6 Simple Methods – ComeHereBoy! Trying to stop puppy biting can seem like a hard task to take on. You want to play with your puppy, but every time you do, she sinks her shark-like teeth into your arm and you soon find your patience wearing thin. 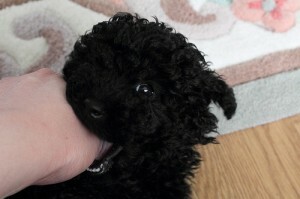 It is totally normal for a puppy to bite. As puppies grow they explore the world much as toddlers do, by using their mouths. Through their mouths they learn textures, tastes, how to pick things up and even how to control their environment. For this reason, make sure to always control your puppy around others. She should not be allowed free reign with other human beings if she then can bite and is not corrected. If that behavior is allowed, it can develop into a serious problem quickly. It is also prudent to keep young children and babies away from a young puppy altogether, because a stray nip can hurt enough to cause a future fear of dogs. There are several ways to help move the process more quickly through training to stop puppy biting when you play together. It is very helpful if you can have your significant other, children and any visitors be informed as to how they should respond if your puppy bites them. In this method, when the puppy bites you harder than you want (for me, anything other than a light brush with the teeth) you either make a high-pitched yelp/squeal or a lower pitched “Ouch” and then turn away from the puppy or stand up and ignore her until she has settled down. This simulates the correction another puppy or a mother dog would give your puppy were they in your place and is something your puppy should quickly understand. Depending on your puppy, one or other of the sounds should make them rethink what they were doing. Sometimes the squeal just serves to make the puppy more excited and so a lower pitched “ouch” works better, for other puppies, they are more startled by the high pitched noise. Just experiment to see what works best to stop puppy biting. Know that a puppy can have a difficult time developing bite inhibition until up to eighteen weeks, so keep that in mind as you begin. 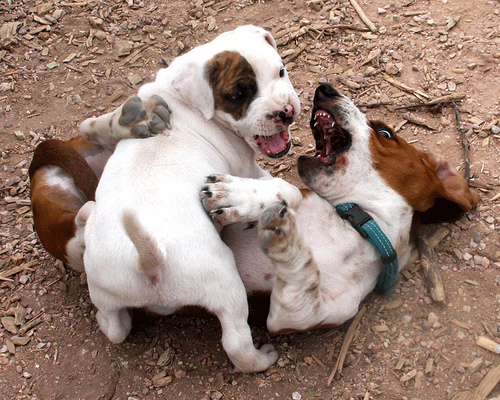 Another thing you can do to stop puppy biting is through play with other dogs. When you chose your puppy, you may have seen her playing with her littermates and as they rolled and tumbled and nipped each other, you may have heard a yelp or two and seen some backing off. A mother dog will also often snap at a pup who bites too hard. This helps teach the puppy how gentle to be when biting. Often puppies who have been taken from their litters before 8 weeks of age, especially when they are a single puppy with limited contact with other dogs, can be hard to train to stop biting. Any adult dog will rarely tolerate a puppy constantly nipping at his nose or ears. If you allow your pup to play with other dogs, over time they can help you in your quest to teach your puppy how to be careful with his teeth. Try not to take your pup to dog parks, but instead control the play with meetups or small groups of other canines you know are vaccinated and well-behaved with other dogs. You don’t want your puppy to become fearful of other dogs because of a dog that over-corrects. Take your puppy to play as often as possible, because this not only helps her learn not to bite, but also teaches her to be comfortable with other dogs. You may have to sacrifice your arms a bit to this one, but you can teach your puppy the difference between “bite” and “no bite” by rewarding the behavior you’re looking for and putting a word to it. This plays on the instinct of animals to increase rewarding behaviors and decrease behaviors that aren’t rewarding. Grab some treats and your clicker before you bring your puppy out to play. Wear a thicker long sleeved shirt that you don’t mind if it gets ripped a bit. When your puppy is not biting your arm, even at the beginning of play time, click every once in a while and say “no bite” or “gentle” or whatever command you’d like to use. 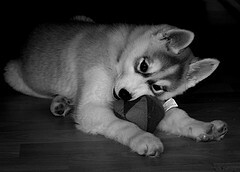 When she begins to bite, put the treats away, fold your arms and ignore her (you can say “bite” or similar if you want to put the biting behavior on command for transferring it to appropriate chewing or biting behavior, such as with tug of war or chew toy. Don’t reward it with treats though.) You can stand up to ignore her if that works better. Remember to always be gentle, even when it hurts. Again, once she has stopped biting, click and treat/reward and say “no bite” again. After a few days, she should start responding to “no bite” if you say it while she is biting, in which case it should be rewarded. Over time, the treats can be backed off and you can merely reward the puppy with petting/play. 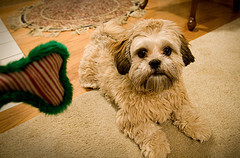 A similar way to do this is by taking a toy out that the puppy loves and holding it on the ground with a hand or foot. The puppy will inevitably bounce on it and try to bite it, but as long as you are holding it firmly, she won’t be able to get it. When she backs off in frustration, immediately click, say “leave it” and give her the toy (or a treat, alternate so that she learns that she doesn’t always get what she wants, but the behavior is still rewarding). She will soon learn that “leave it” means she gets something if she takes her mouth off of it. You can apply this to biting by training her on the word with a toy and then using it if she bites your arm. Maybe your puppy is biting because she needs some stimulation for her mouth. Try giving her chew toys while she’s in her crate to keep those teeth busy. Or you might try playing fetch or tug of war, praising her or treating her when she is biting appropriately. This may help her get her “mouth fix” and stop her from biting your arms instead! Along these lines, she might just need to run and play and wear herself out before you start getting on her level. It’s also very tempting to wrestle with your puppy when you get her out of her kennel, but if she gets crazy and starts nipping when you do this, then you need to change tactics. Try petting her softly and speaking quietly and rewarding her when she responds appropriately. Save the rough housing until she has command of her teeth. This method is very similar to the “yelp” method. When your puppy starts rough housing, it’s time for her to settle down in her crate for a few minutes. When she starts biting, immediately give a short “ah-ah” and put her in her kennel. Proceed to ignore her for a few minutes, at which point, if she has settled down, she can come out again. If you use this method, you may want to play with your puppy in a confined space near her kennel, so you can easily put her away. Hopefully one of these methods will work for you and you’ll have a delightful puppy to play with soon! If you’re looking for more information on teaching bite inhibition, Pat Miller has a great article here. Are there any other things you’ve tried to help stop puppy biting that have worked for you?